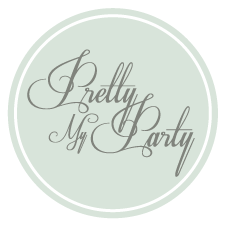 My sister and I live in different countries and dream about styling a party together. 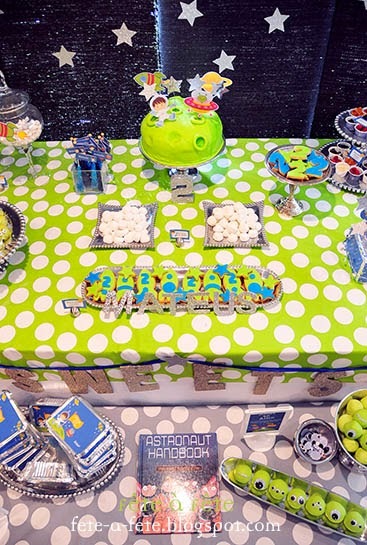 She's a graphic designer and her little astronaut printables collection was my inspiration for my son's birthday party, as well as a wonderful collaboration experience. 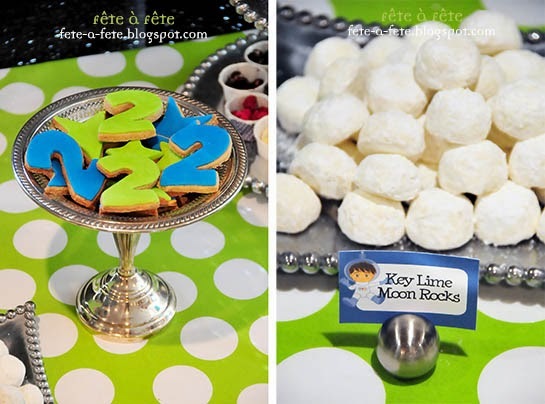 It was also a fun concept for a 2-year-old boy party! 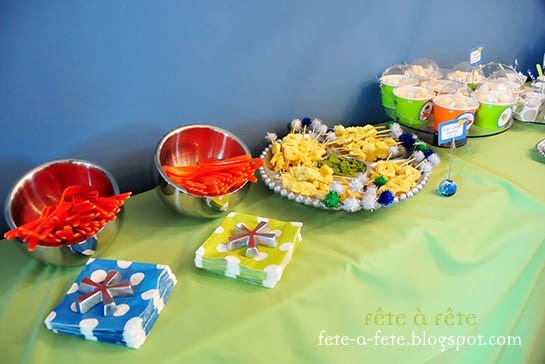 To coordinate with her designs I used green, blue and silver throughout the decoration as well as a little pop of orange. 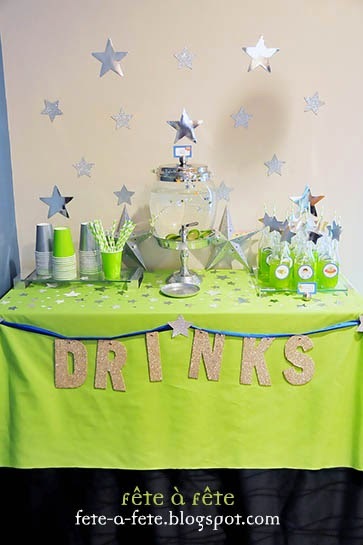 I added a touch of green and silver polka dots - from the table cloth (a piece of fabric atop the always reliable white cloth) to the napkins, drinking straws and favor boxes. 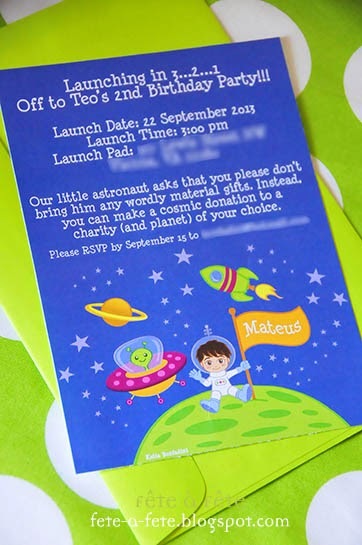 The invitation from Casos & Coisas da Bonfa. 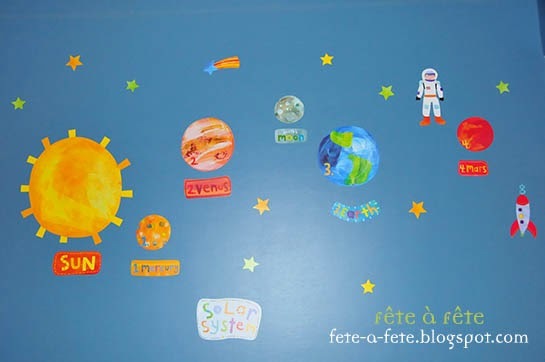 The highlight, or "pièce de résistance" of the fête's décor was the solar system planets made out of paper lanterns (as you can see in the previous post), scraps of tissue paper and other supplies I already had at home. I moved our dining table in front of our large windows so the dark curtain panels could be the backdrop to many silver shinny stars. 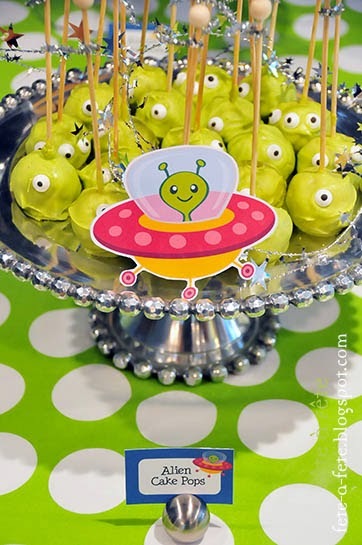 For the sweets table I made "green alien" cake pops with a pistachio buttercream (which was absolutely delicious!) 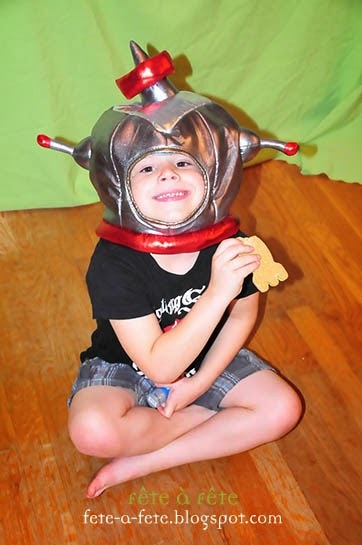 and whole wheat cookies shaped as rocket ships, stars and the number 2. 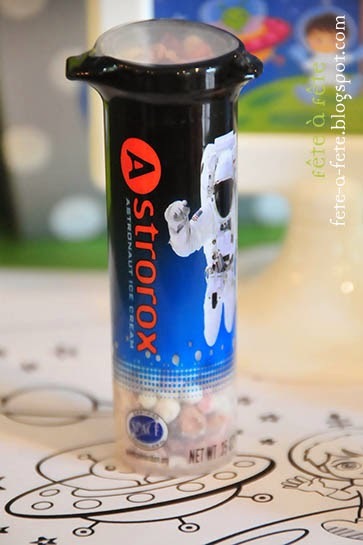 I also served astronaut ice cream drops and the same freeze dried fruit that astronauts take along on space missions. 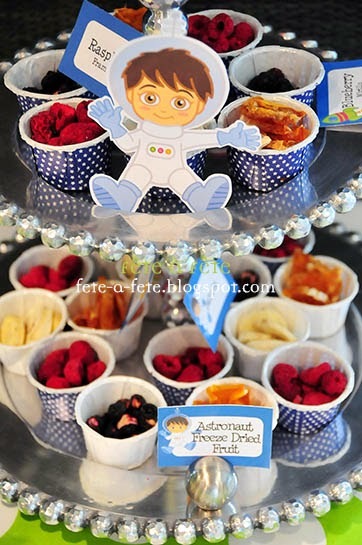 Freeze dried fruit from Trader Joe's and Whole Foods - raspberry, blueberry, banana and mandarin oranges. I knew I wanted a simple but remarkable cake, and I got just that. 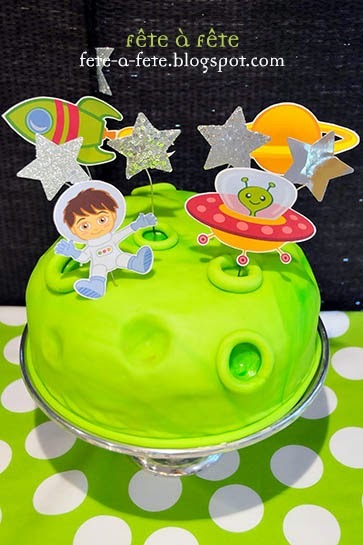 I ordered a "green moon" crater cake from Sweet City Desserts and added paper cutouts using my sister's designs. 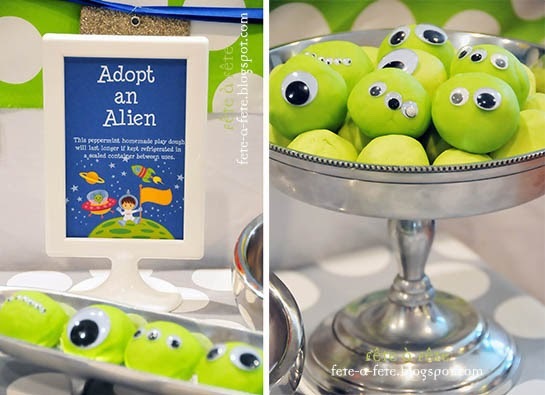 The little ones loved to create their own aliens as well! 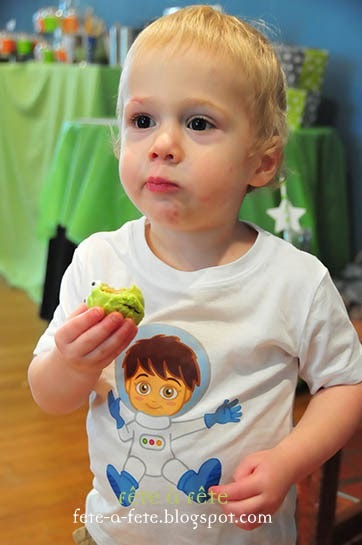 For the play dough recipe, check out last year's party here. 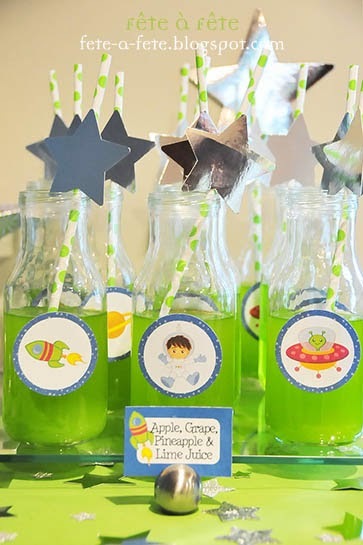 The drinks station: lime water and green juice - a mix of green grapes, green apple, melon, lime and other green fruits. 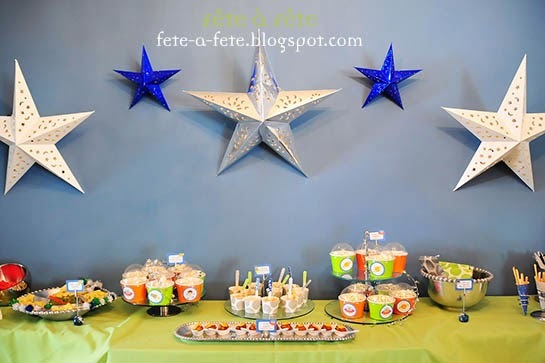 I finally got to hang my adorable star paper lanterns purchased at San Francisco's Chinatown - they went behind the food buffet. 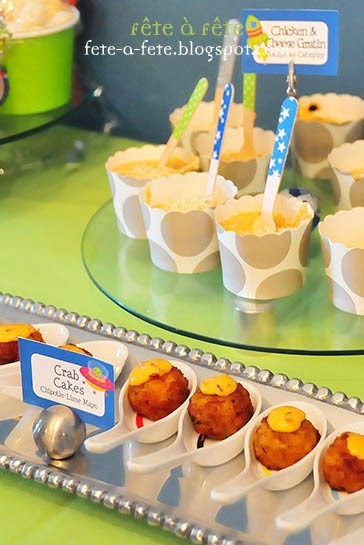 Some of the food pictured: tortellini pasta on a stick, biscoito polvilho (tapioca puffs), Catupiry chicken (chicken and cheese gratin), mini crab cakes on tasting spoons with chipotle aïoli, popcorn, pão de queijo (mini tapioca-cheese bread), grissini and whole wheat pretzel sticks with mustard. 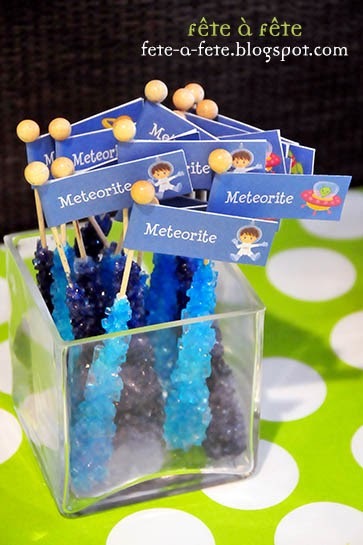 We just have to have this treat at every kids' party! 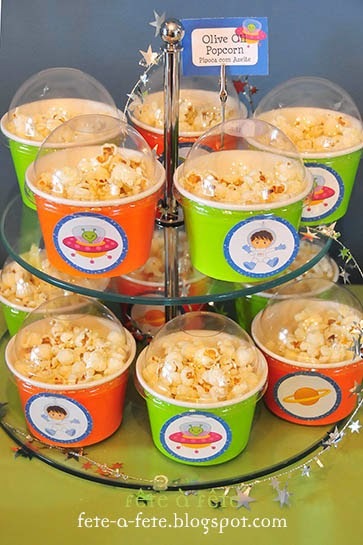 I served popcorn and tapioca puffs (biscoito polvilho) inside ice cream cups with plastic dome lids, since they had a flying saucer quality to them that I just loved! Embellished wood spoons - in case you've missed the previous post. 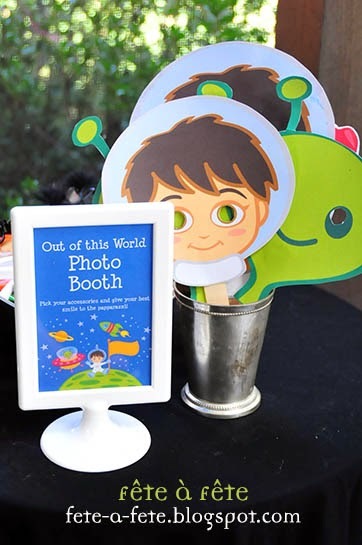 Adults and kids alike had fun at our "Out of this World" Photo Booth, stocked with funny props, including astronaut and alien paper masks, inflatable hugging aliens, alien sunglasses and a space helmet. 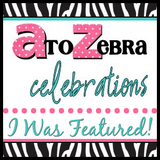 We had one last year too, check it out here! 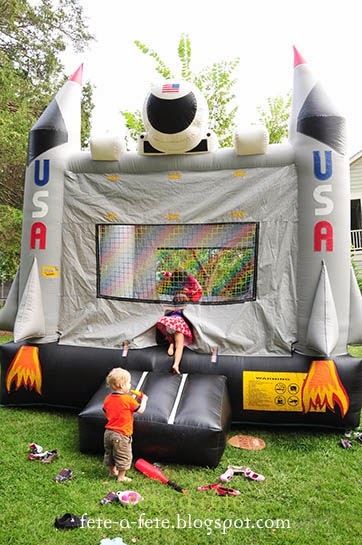 Finally, for the kids' complete bliss, we rented a rocket ship moon bounce from All Bounce Parties and had a space module tent on the backyard so they could burn all that sugar play all they wanted. And so they did! 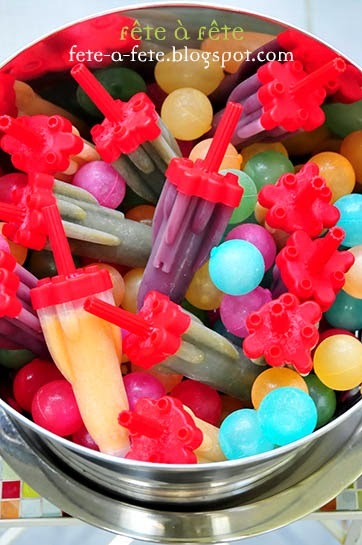 A nice cold bucket filled with 100% real fruit juice rocket ice pops. 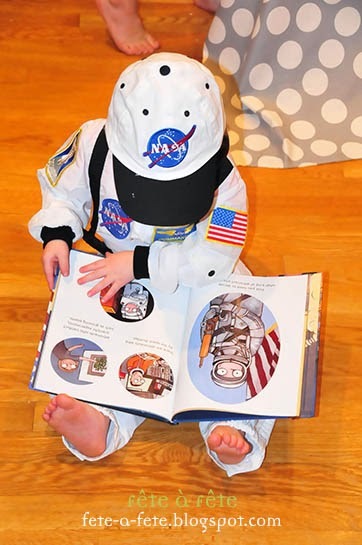 Is he an alien going undercover as a US astronaut? Watch out!! 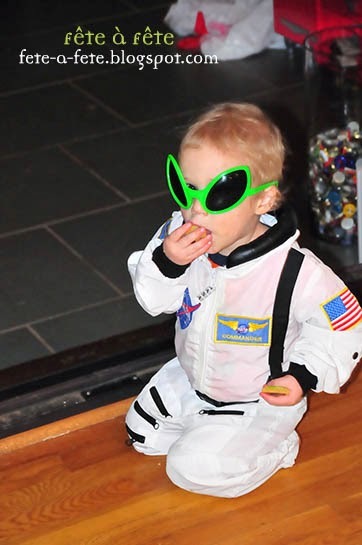 A space man attacking a rocket ship cookie! 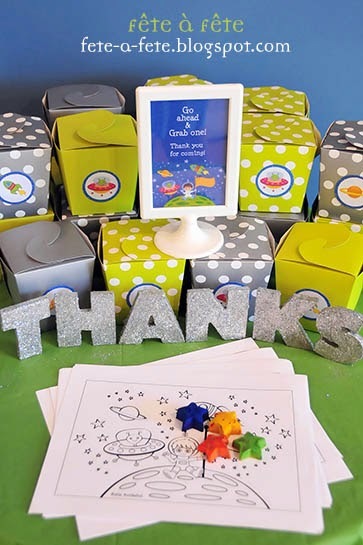 As party favors, kids took home the play dough, recycled crayons (with instructions on how to make them - see below), custom coloring pages and some of the hugging aliens. 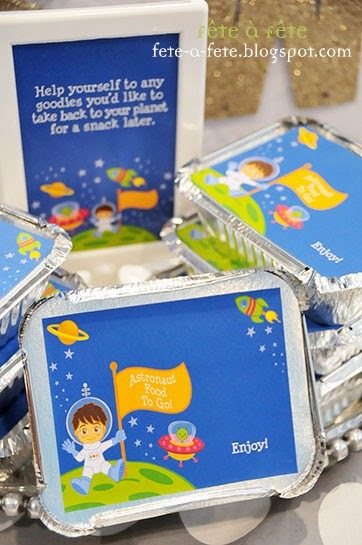 Cute customized aluminum boxes were available for guests to take home the delicious cake and other treats. So, that's it. 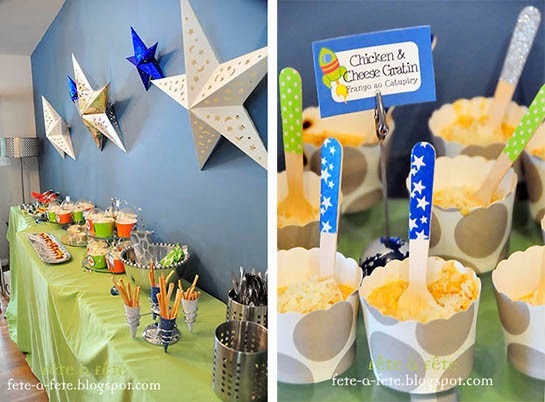 I said I would go very basic and do a much smaller and "no-frills"party this year, due to soooooooo many projects lately - two big moves, career changes, kid starting school, mom starting school, and the list goes on... 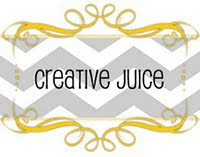 I tried to keep things simple, and gave myself permission to cut many project ideas that kept popping up on my mind. But I just couldn't resist on some of them and did more than I anticipated. 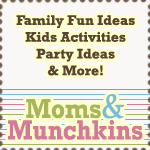 It was all worth it, and one of the best parties I put together (at least in terms of fun - my kids LOVED it!! 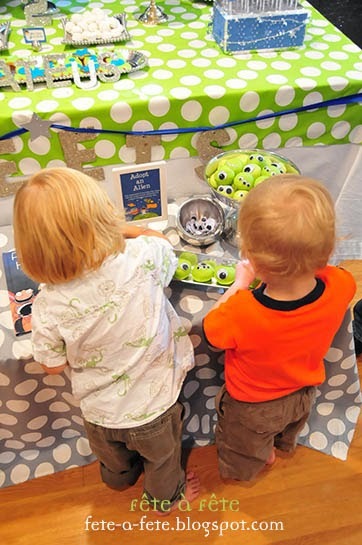 ), especially considering the short time and modest budget. 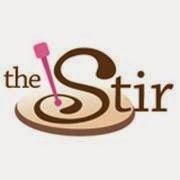 Thanks for visiting and have a fantastic week, everyone! 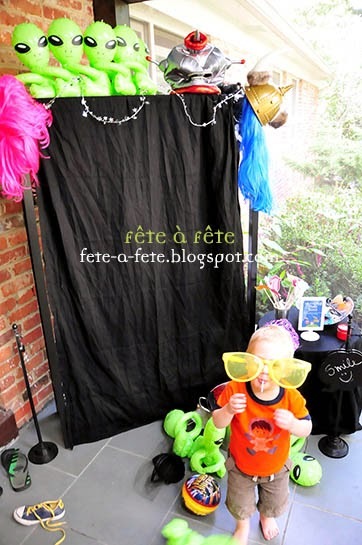 For more details and a little "behind the scenes" of the party, go to the previous post here. 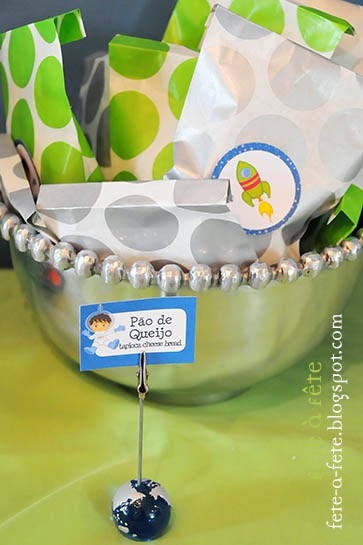 Super obrigada pelo carinho e elogio, Paula :-) Uma ótima semana!! 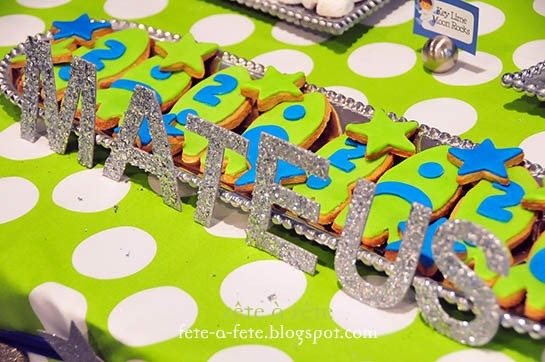 Muito lindo ... parabéns !!! 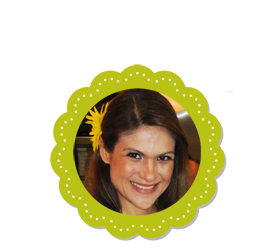 Flavia,ficou linda a festa! 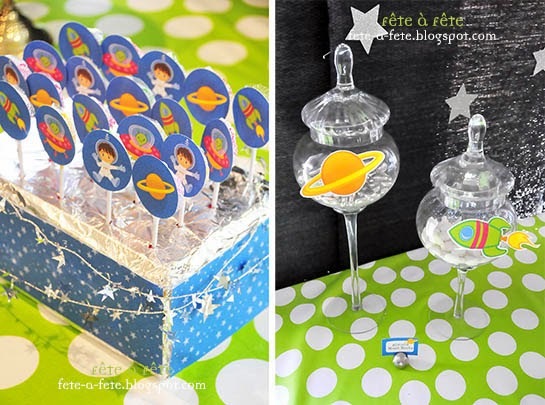 !Gostei dos planetas. Obrigada, Milena! 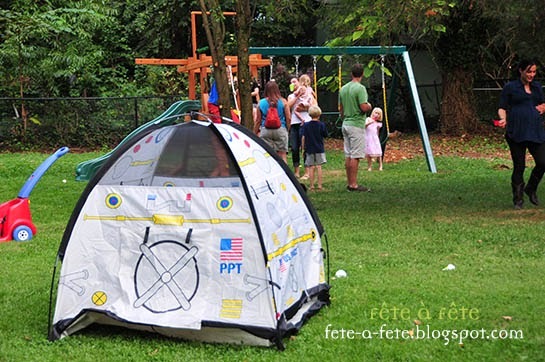 É um ótimo (e fácil) projeto pra fazer com as crianças. E pode-se aproveitar depois. 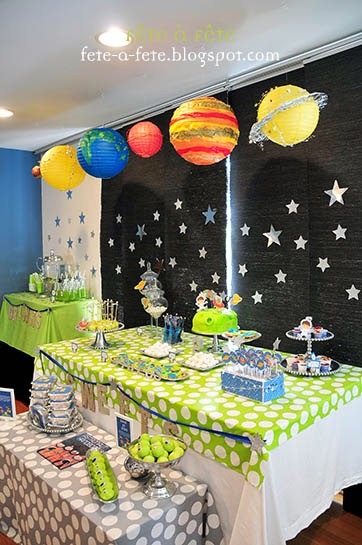 No nosso caso, um dos convidados os levou pra casa pra decorar seu quarto temático :-) Beijos! AMAZING! 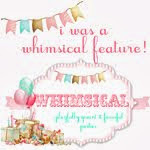 I just pinned this and am so impressed. 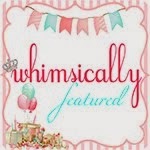 If you call this a no-frills party, then I'd love to come to one of yours where you go all out! Well done! Thank you for the kindness, Kat! 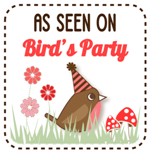 Well, as I said, it did get much more elaborated (and time-consuming) than I expected, but it was still a very economical and somewhat practical party :-) You'll get a special invite for the next one!!! Love it! How do you do it? If this was a no-frills party I would love to see one where you go all out! So very impressed! 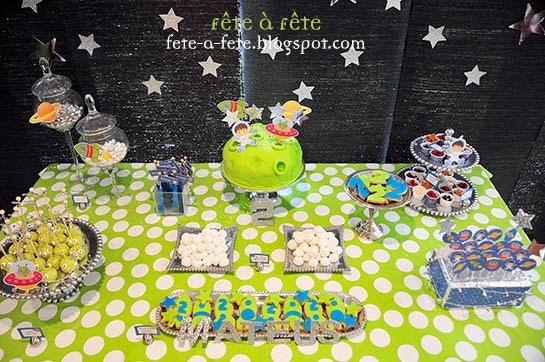 There are so much details to love in this party! It was truly a feast! 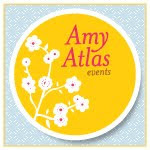 I love the designs -- so vibrant and cute! 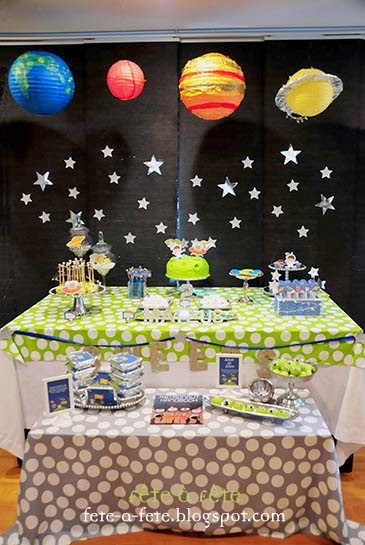 Especially love the take-home aluminum boxes and handmade solar system decor :) Awesome party. I had a blast even just looking at the photos!